This is what my father said to me as we talked about him approaching 70 and me gliding through my 30s. My father has always operated with a level of introspection that I admired. It’s no wonder he eased into accepting me and loving me as his son. I think of my transmasculinity as a place that comes from within. It’s tethered to the spirit of who I am not by what is imposed on how I should be. Trans masculinity, in that respect is antithetical to cismasculinity in its current state because cismasculinity gets its power from how it's authenticated by everything and everyone outside of it. And for every made up indicator of what masculinity is, there are 10x as many things that can undo manhood with the effortlessness of a hot knife through butter. Coming into manhood by way of deliberate legal, medical, and social transitions as opposed to birthright gives space for a lot of questions. Too often those questions stop at the medical processes, gender marker and name changes not giving enough time and attention to what it means to be a man in the world. And I don’t mean in the context that being a man is so complicated or noble that it needs so much deliberation, but because it has so much to account for. Being a man comes with enormous privilege and subsequently enormous responsibility. Everyday I’m challenged with how to meet that responsibility particularly when it feels like so many cisgender straight men aren’t. For me, being a man of transgender experience means having to start from the inside and not relying on any outside markers of gender; that’s what had me in the wrong gender expression and identity in the first place. Relying on everything else to define how I exist in the world instead of searching within. I’ve had to dig deep. In the silence of introspection and frustration I began to pull from within my authentic self, regardless of how scary and complicated it would be. This excavation of self is an ongoing process of becoming the man of my own dreams. A man by my design. Particular now. With the ongoing state sanctioned violence against Black men, the violence that is perpetuated by us (namely cisgender men) and a cultural matrix that limits our expression of joy and compassion, it’s hard to find examples of how to be healthy in my black masculine body. I’ve decided to be that example. It’s important that I’m visible, not just for the trans community but as a Black man trying to get free who is operating with the confidence that freedom mushrooms from the inside out, it’s not given by any official or system or homeboy approval. It’s about being a model of possibility for all those who embody masculinity in some way. I want to challenge, aggravate and change the way we talk about men and masculinity. The time is now for us to dig deeper and be better. For the next 100 days I’ll be posting every day on instagram and twitter lessons learned, contemplations and promises I make to myself in order to become a man of my own design. Stepping outside of the austere limits of what masculinity is can only set us free. And I need freedom too. It's been one year today since I lost my mother. I was speaking to my nephew a couple days ago and he said, "I can't believed I survived a year without her." Me too. I always told her that when she died I'd jump in the casket with her. She would say, "Hush boy, you'll be fine." And I guess that's true. I am "fine", in all it's ambiguity. There still isn't a day that goes by that I dont miss her. I don't go more than a few hours without thinking about her. All the good meals and good times I've had this year, all the cities I've been to, at one point I've whispered, "Damn I wish Ma was here." I think the worst part about this milestone is knowing that this is the first of many. Today it's one year, then it's five, then 10, then a whole lifetime. Memories become fuzzy and details get mangled. I'm afraid to lose the vibrance of the memories. The sound of her laugh, the width of her smile. The 2 hour long conversations on Saturday mornings, the jokes and the advice. It heartbreaking to know that the nature of time will fade the past. But the broken heart will always stay the course. Watching a woman who was so robust and strong so full of laughter and love literally wither away right in front of my eyes is a trauma that has marked me forever. Sometimes I feel more like a man-child, guessing my way through adulthood hoping not to muck it up too much. It's like when a child does something well, their first cartwheel or wheelie on their bike, they look up to see if mom is watching. Every accolodate and every appearance. Every published article and every award. I look for my mother. Not hearing her squeal in delight about my accomplishments, not being able to watch her gush and squeeze me saying, "I just love you, Tiq-a-boo," makes it all a bit bland. But we march on. All of us that have lost our mothers. We live another day carrying a light for her. The women who bore us. The women who raised us. It feels like a club. I call it "the dead mothers club." The natural order of things says we'll all be a part of this club one day and rightfully so. We're suppose to bury our parents, they're not suppose to bury us. It was the other folks around my age who gave me the best advice when my mom passed. People's prayers and condolences were nice gestures but that's where it stopped. They all knew there wasn't enough "love and light" in the world that could take the pain away. . They all told me the same thing: The pain never goes away it just gets more managible. We will always miss and cry for our mothers. And I remember everyone. 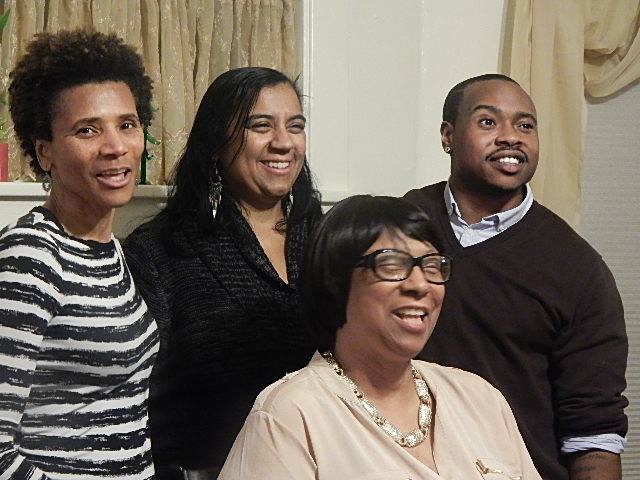 All of us who are motherless in the world. It always fascinated me that people actually survived without their mothers because I just knew I wouldn't. But I remember all of us. Ericka and Chanel...Krystal and Lola...the twins Busta and Keisha...Jonte...Anthony...Data and LaCarrie...Simba and Angela...Aja, and Bree...Qumari and Syeeda...motherless. Yet I'm honored to be Mary's child. I'm grateful to have been raised by her in all her old school austerity. The wrath of her authority and protection was a fierce as her love and comfort were gentle. I look forward to passing on all the lessons she instilled in me in my child....love them just as hard...watch over them just ferociously. White Women Taking Up Space. Theoretical or Otherwise. My wife and I watched as the Rachel Dolezal scandal blossomed on twitter then caught fire on every social media platform. What I initially thought was a satirical article from The Onion turned out to be real life. Someone actually masqueraded as Black for over a decade. Kim looked at me and said, “Someone is going to say she’s 'transracial' and compare this to the transgender experience. I promise you.” Needless to say, this weekend, #transracial and #wrongskin trended and people are actually trying to have a serious conversation about it’s validity. 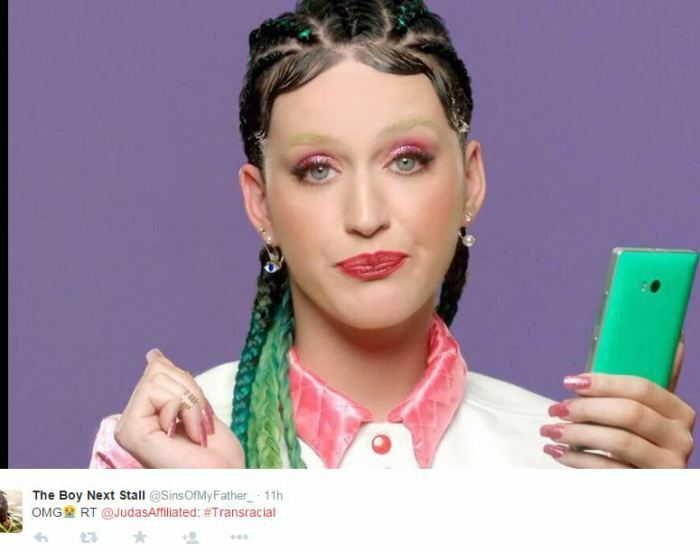 However transracial isn’t a thing, but cultural appropriation is. There is a long and sordid history of fetishizing Black people and culture, profiting off its production and its exploitation simultaneously. Rachel Delozal is no different. She received a full scholarship, reserved for a Black woman from Howard University, one of the most renown Historically Black College’s in the country. She was active in Black community and racial justice work. She gradually began the mimicry and performance of Blackness with dreadlocks, ankhs, and academic rhetoric to back it up. She bamboozled hundreds of people for years. Rachel created narratives of racial profiling and harassment that are all now being called into question. She even told a reporter that she was born in a teepee, hunted food with bows and arrows, was beaten with a bamboo whip (“same as the ones used on slaves”) and lamented about how her mother lined her and her siblings up by complexion to be punished. For a white woman, pretending to be Black, to interject a slave narrative into her own made up childhood is more complicated than your every day cultural appropriation. This is just creepy. These details that have surfaced about her life and the lengths she went to secure the deception and fuel the obsession makes it easy for some to assume there are some serious mental health issues at play. Regardless, that doesn’t preclude her from being abhorrent and racist. 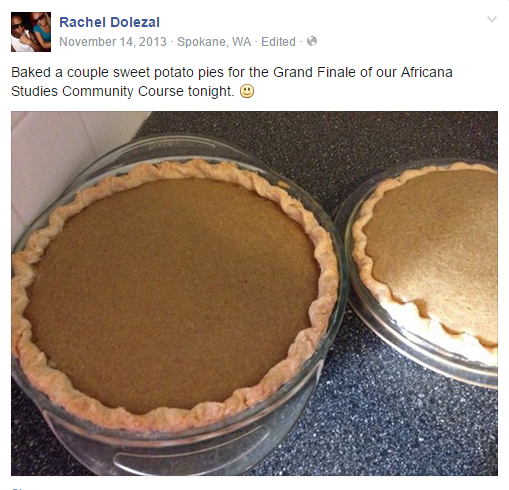 She tried in earnest to fabricate a Black experience, braiding hair and making sweet potato pie for the handful of Black folks in Northern Idaho and Spokane. She studied the culture and took up spaces and opportunity that were for Black people. There aren’t enough African American studies classes to recreate ancestral spirit and the depth of trauma and resilience that it marks us with. 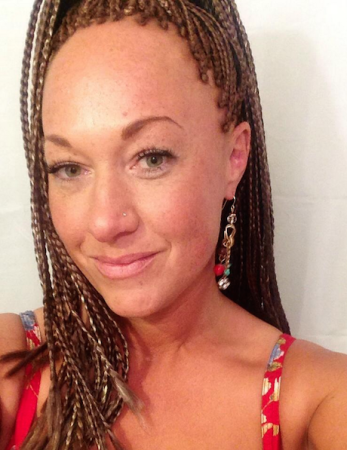 Dolezal lied and deceived people for the opportunity to ascend the ranks of her career and continue to invest in her delusion. Her existence is an eraser and replacement of actual Black women while at the same time trivializing a very real complex African-American experience. This is not “wrongskin”; this is the co-opting and eraser of Black femininity and is all too common. Being born white with all its privileges and for some its internalized guilt isn’t driving people to suicide or getting them kicked out of their homes or isolated from their families. “Feeling Black” isn’t preventing you from getting adequate healthcare or getting you murdered by the police. “Transracial” literally means involving or between two or more racial groups. “Wrongskin” is not a thing, but being transgender is. To draw parallels between the exploitation and fetishizing of Black culture to the transgender experience and existence of trans folks is completely ridiculous. It’s insulting particularly for trans people of color because, this silly fiasco has completely hijacked a moment. We’re having serious discussions about race and being trans after Caitlyn Jenner’s debut seemingly eclipsed every other trans experience including those who have fought their entire life for that very same validation. Now here is another white woman, in all of her opportunistic chutzpah, co-opting a Black experience. I, as a Black transman, feel triggered because our intersections are being coveted and we have less space to stand. We’re back to questioning the validity of a transgender identity because this one white woman took things too far. We’re pivoting from meaningfully discussing racialize trans-misogyny and its systemic effects on our community because Rachel Delozal, the President of the NAACP Spokane chapter, catfished everyone around her. Instead of looking at the differences between race and gender and it’s intersectional influences folks are using this as an indication that they exist in the exact same way. It’s unfair and maddening. Delozal’s obession or pathology has absolute nothing to do with transgender people or our process. Race isn’t something you study and dress up as nor is gender solely a cultural performance to be tried on. This whole ordeal is a distracting digression that hopefully by next week we would have all had our fill. In, Dear Knee Jerk Daniele Watts supporters, writer Ricardo Hazell completely misses the mark by falling way short of understanding the larger issue and letting his own misogyny cloud his analysis. I had to read him for points. "This article is completely misguided white nonsense. First, there is no such thing as playing the race card if we are living, loving, working and fighting within racist systems. For you to trivilized this as "playing the race card" or low key charactierizing her a hysterical angry Black woman is a prime example of racialized sexism that is stagnating and doesn't move the conversation forward. Racism is much more nuanced and complex then what you seem to understand. Let me make it simple for you: Just because she was not being arrested for being a prostitute doesn't mean that race doesn't play a factor into how she is treated or the immeidate reaction to her sexuality. Racism is not just a direct action from one person to another, ie. "this person called me the N-word", this cop mistook me for a prostitute because I'm Black." Racism or white supremacy, is a pyschological framework. it's an institution. Law enforcement is an institution entrenched in white supremacy as we have seen throughout history. As we have seen very recently. Why not be, as you put it, "hypersensitive." White people are "hypersensitive" to our presence, why should we not be "hypersensitive" to their ubiquitous racism? And we, Black men, have to be "hypersensitive" to racialize misogyny that tears down and humiliates our women every day. According to her boyfriend, this is the third time this has happened to them, so she has every right to be very vigilantly about instances of racial profiling or racialized sexism without being couched in language that makes her seem crazy, particularly after she's handcuffed and crying, her boyfriend makes jokes that sitting in the police car is "good for her." And why you would lead with a quote from Koby Sellout Bryant about Trayvon Martin when he was wrong, cowardly and a complete embarrassment. As well, closing with the advice to Black peopl to "pump the brakes" on recognizing racism is just as wrong, cowardly and embarrassing." Billionaire Donald Sterling the owner of a team of Black men who generate $128 million a year for the LA Clippers franchise got caught on tape telling his Black girlfriend, V. Stiviano, that he didn't want Black people at the games. His rant was met with disgust, shock and surprise. People were disgusted that a man who donates money to the NAACP and was slated to win an award from the organization would harbor such vicious anti-Black racism; they were shocked that he would be so brazen and clueless to cavalierly explain this to his Black girlfriend; folks were surprised that in Obama's "post racial America" this vitriol still exists. Of course we're all disgusted by the whole situation but my frustration lies in the reactions. The Clippers still suited up and played their fourth playoff game against the warriors to a sold out crowd where seats can go for over $1000. None of this massive amount of capital would be possible without the commodified Black bodies that are traded and negotiated, sculpted then thrown away. We are the ones that make sports into cultural cornerstones. It's because of these Black bodies that sporting events are like national holidays complete with pageantry and billion dollar religious fervor. Today was the first hot day of the season and I was sweating buckets waiting for the 6 train. After 20 minutes it was announced that “due to a signal malfunction at Parkchester there is no 6 train service from Pelham Bay to Hunts Point. Use alternative bus routes.” Alternative bus routes don’t actually exist. I picked up my bag, bottled up my frustration and hailed a cab. When I plopped down in the backseat of the cab I told the driver that the 6 train wasn’t running and I needed a ride to the 2 and 5 stop. He said he needed to call his daughter. He wanted to relay the information to her so she didn’t get stuck waiting. He then started to talk about the death of the young Hofstra student, who was accidently killed by the police during a wild shootout with an armed robber. He lamented, “You send your daughter off to school and the people that should protect her, kill her.” I could feel his anxiety. I know, as a father, he could only imagine the anguish the family of Andrea Robello felt. He then went on to tell me about police profiling and being pulled over by the cops earlier that morning because the large backpack sitting in the front seat of his livery cab was “suspicious.” He said, “They always bother guys like us. But the white guys, the Jews, nothing.” Again, I understood his anxiety. And in that brief 5 minute car ride he was able to unload on me his fears and frustration at the violence and the bigotry and how unfair it all is. We bonded as two men of color that are always on someone’s radar. All I could think about was Mark Carson. 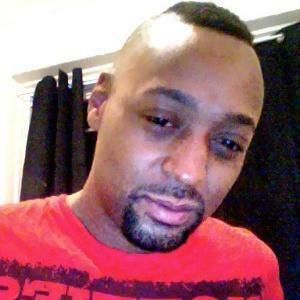 32 years old, shot in the face in a “safe” neighborhood because he was gay. I wanted to share my anxiety around his murder. I wanted to share the fear, the heartbreak. I didn’t know Mark Carson. But I know hundreds of Mark Carsons. Young and gay and black and enjoying just another night. That could have been any number of people I know. Although I’m straight identified that could have been me. Just another warm night in the West Village with the people that know you, in a neighborhood that helped raise you, where you’ve collected memories over the years. Yeah. That could have been me. But I didn’t say anything. Not a word about Mark. Maybe I should have. Maybe I didn’t want to hint at the part of me that made me unlike him. The part of me that may put me on HIS radar. He would never guess I was transgender but he may make an assumption about my sexuality that would then invalidate me as being "man enough" to have this conversation around vulnerability and being policed. Maybe I was afraid that he would trivialize Mark’s death as a testament to his sexuality. I’m not quite sure of why I didn’t say anything. But, I know that it’s within this silence that the conversations need to be had. As men of color from all walks of life, we are connected by the all too often tragedies of “our own.” We are all bonded by the humiliation of being perceived as a criminal or a suspect when all you’re doing is minding your business, driving your cab, or enjoying a warm night. His heart should go out to the Carson family just as it did to the Robello family. Because of my own fear, I would never know how he felt about a gay black guy getting murdered in the gayest neighborhood in America. I don’t know if he would be just as outraged at the crime rate in the city when the victims aren’t like him and more like me and the people I love. I do know that fear is the partition. It’s time to let it go and bring everybody to the table. We can’t heal and grow as human beings when we allow our fear to dictate what a worthy vulnerability is and what isn’t. Who can mourn what and who can’t. I’m sorry that I didn’t speak his name in that moment. But, it’ll never happen again. Rest In Peace Mark Carson. I was given the opportunity to be a part of the Live Out Loud campaign and I couldn't pass on it. Scary, yes, to know that my image would be blasted all over New York city making my transgender experience tangible where it usually is merely my private medical history, locked away in stealth and unbeknownst to anyone who I may come across. I've been praised for my courage and bravery, which I appreciate but for me, bravery infers that I am up against something dangerous, something worth guarding against. However, I never for one moment feared anything. Not for one moment did I think about a backlash or a hate crime. The worst that may happen is some kid blacking out my teeth with a sharpie or scribbling some harmless vulgarity, but that's about it. What's important is that people (particularly other black folks) see that there is diversity amongst black people. We don't all have the same journey or the same story or the same mind. The story of our lives is just as different and varied as our complexions; and our differences from the straight Black Christian matrix doesn't negate our blackness. We are on the LGBTQ spectrum. We study non-traditional religions with great faith and discipline. We grow up in suburbs. 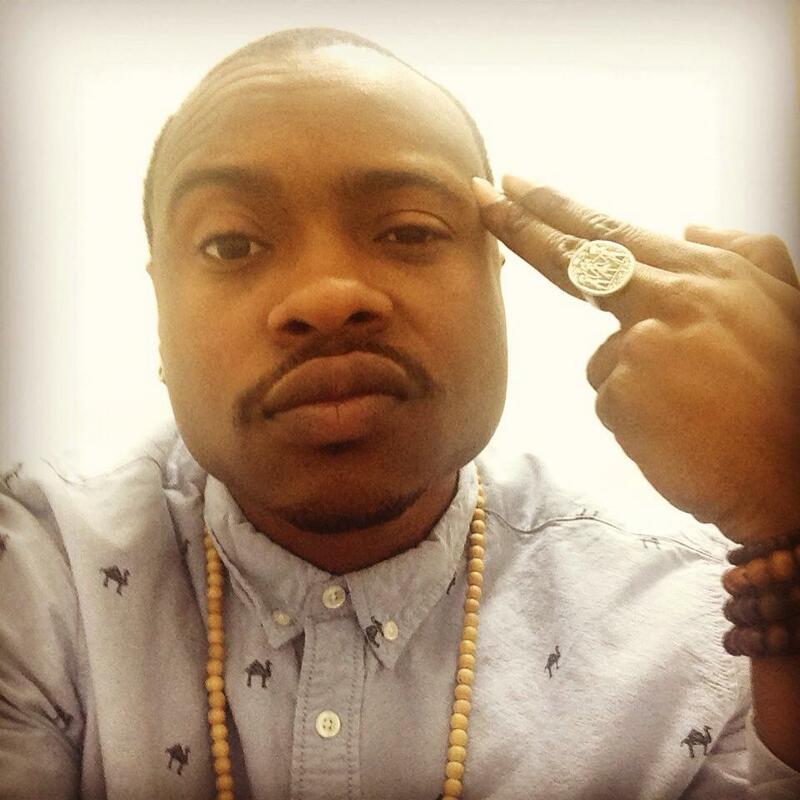 We love music that speaks to us, and when the Hip-Hop and R&B Top 40 doesn't, we haven't sold out. We just haven't bought in. We are not apologists and we don't appease. We are the Black life in America that you don't see. The part that's pushed to the margins to fend for itself and only whispered about in shame or frustration. The daughter that refuses to wear a dress. The son that can work a mean pair of pumps. The Afrocentric nappy-headed queer that was deemed too weird or too black or too something. We love our community, even when it ignores us. This is who I represent. This is who I am. We are the Black life in America you don't see.